Heavy gauge thermoforming is the process of heating plastic sheet material and constructing it into different molds and shapes. 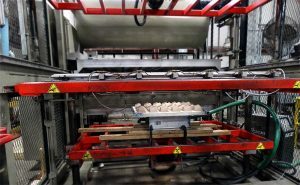 Advances in technology and equipment mean there are various methods to the thermoforming process, each with their own strengths and weaknesses. Professional engineers are one constant between the different methods, overseeing the process from start to finish. Due to the versatility of thermoformed products and the diversity of different environments and uses that thermoformed parts are needed for, there are many details to be taken into consideration when determining which thermoforming process to use to ensure that the final product is perfect for its intended use. These details include impact resistance, temperature, UV resistance, color, and design. Injection molding is a thermoforming process in which thermoplastic pellets are heated until they reach a liquid state and injected into a mold using high pressure. The parts are then ejected from the mold after the cooling process and are able to be painted or silkscreened. Injection molding allows for low per unit part costs, which is an advantage when a large number of units are required for a project and can offset the higher upfront costs needed when creating the mold and injection tool. Additionally, injection molding allows for customization of the product in materials and properties. The vacuuming forming process takes large plastic sheets and heating them to a pliable physical state. With the vacuum, the air is extracted from between the plastic sheet and the mold, forming the plastic sheet to the mold precisely. Vacuuming forming is one of the simpler methods of plastic forming and is an ideal method for certain materials like acrylic. The transparency of acrylic means that thermoformed parts can be manufactured to replace fiberglass components. One of the newer advances in thermoforming is twin sheet forming. Twin sheet thermoforming molds duel sides of a product together during the thermoforming process. This process of thermoforming allows for more complex custom plastic products to be created. Twin sheet thermoforming is the ideal process when constructing opposite sides of a product. The types of products made using this process are foam-filled products, products with multiple colors and textures, and products with different levels of thickness. Pressure forming is mostly used for products with tight details, custom colors, and smooth textures. The process involves molding plastic sheet material into detailed shapes and structures. The aesthetics of pressure formed products far exceed products created using other thermoforming methods, making it an excellent process for finishes or for products that need quality edges. If you are searching for a thermoforming company servicing the entire state of Virginia including Richmond, Chesapeake, Virginia Beach, Norfolk, or Arlington, contact the leaders in custom thermoformed plastic, Advanced Plastiform, Inc. With its central proximity to the Southeastern US, Mid-Atlantic and Northeast, our North Carolina facilities are uniquely positioned to best serve your Virginia company needs. API offers customers the expertise of staffed engineers and on-site manufacturing and inventory management. From concept to delivery, API is your solution for heavy-gauge custom plastic manufacturing. Call Advanced Plastiform at 919-404-2080 or fill out our contact form below.